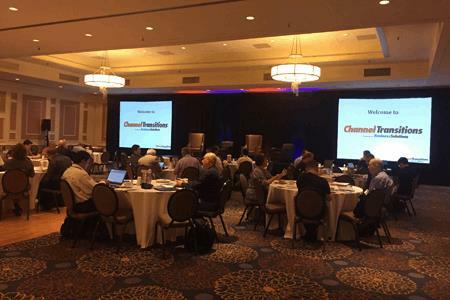 The Channel Transitions VAR/MSP Executive Conference, powered by Business Solutions, September 14 at the DoubleTree Boston North Shore, featured presentations from leading channel experts. The event educated a diverse group of solutions providers about implementing or improving a recurring revenue business model. Brad Giles, Director of Channel Marketing at Cayan, presented, “Payments - Create and Protect Recurring Revenue Opportunities” in a breakout session. Rohan Mani, Director, Reseller Channel at Harbortouch, presented “POS-as-a-Service” in a breakout session. For additional coverage of the Channel Transitions conference, visit http://www.bsminfo.com/solution/inside-channel-transitions. Channel Transitions was sponsored by Cayan, Harbortouch, Interwork, SOCSoter, and Vantiv, along with industry association partners The ASCII Group, CompTIA, HTG Peer Groups, and the Retail Solutions Providers Association (RSPA).